`Last December, a woman entered my apartment who looked exactly like my wife...' Dr Leo Liebenstein is convinced that his wife has disappeared and that she has been replaced by a double. While everyone else may be fooled, Leo knows she cannot be his real wife, and sets off on a quixotic journey to reclaim his lost love. With the help of his psychiatric patient Harvey - who believes himself to be a secret agent who can control the weather - Leo attempts to unravel this mystery. Why has his wife been replaced? What do the secret workings of The Royal Society of Meteorology have to do with it? Who is the enigmatic Dr. Tzvi Gal-Chen, and is he, or maybe his wife, or perhaps even Harvey, at the centre of it all? From the streets of New York to the southernmost reaches of Patagonia, Leo's erratic quest ultimately becomes a test of how far he is willing to take his struggle against the uncontested truth he knows to be false. `Atmospheric Disturbances' is at once a moving love story, a dark comedy, a psychological thriller, and a deeply disturbing portrait of a fracturing mind. 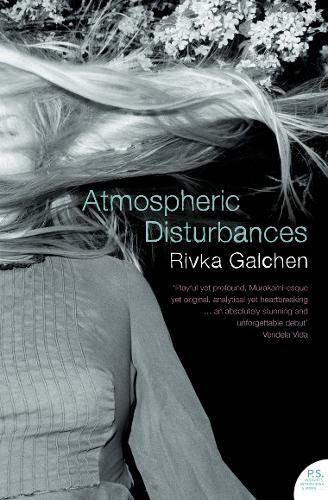 In this highly inventive debut, with tremendous compassion and dazzling literary sophistication, Rivka Galchen explores the mysterious nature of human relationships, and how we spend our lives trying to weather the storms of our own making.